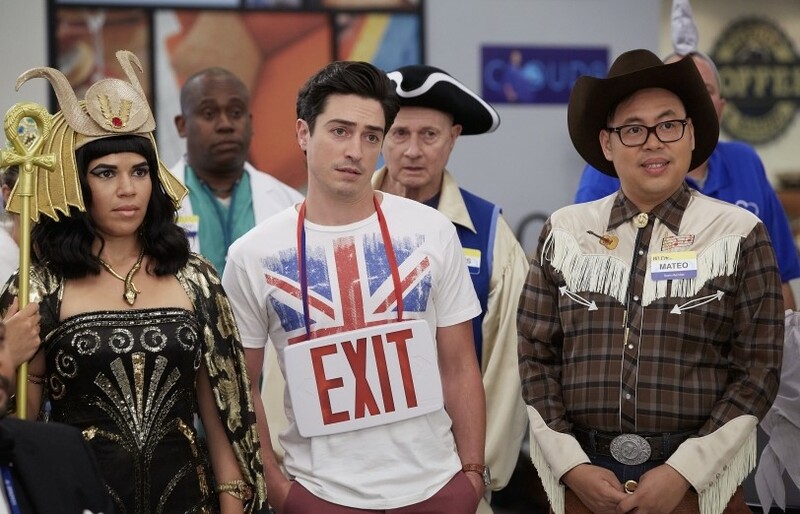 Superstore was back to what it does best in the latest episode — putting our beloved characters in ridiculous situations and letting them fumble their way out. In what I hope becomes an annual tradition, the team welcomed Halloween to Cloud 9 in the only way they know how: with sarcasm and ennui. At the start of shift, Dina puts the employees on high alert for any suspicious activity they may encounter. The team, however, is much more concerned with the fact that Dina is the only one not wearing a costume. Dina’s not about to be peer pressured into wearing something... until she realizes that Sandra dressed up as her for Halloween. Not wanting to be twinsies with Sandra all day, Dina grabs the first costume in the Halloween aisle without even looking at it. Meanwhile, Mateo gets a pleasant surprise when Jeff turns up. There was a stabbing at a neighboring Cloud 9 so Jeff thought he’d drop by and take Mateo out to dinner. The relationship all still has to be hush-hush, of course, since Jeff is regional manager, but Mateo doesn’t mind. While Mateo and Jeff get their date details settled, Amy, Jonah, and Glenn are at the front of the store handing out candy to all the kids. Just then, Dina walks up and tells one of the moms that candy from strangers can contain razor blades and heroin needles. The mother dashes off with her child. Glenn is upset and tries to stand up to Dina about the situation but fails miserably. To prevent Dina from further berating Glenn, Amy and Jonah tell her that they saw some suspicious people headed to the store room with toilet paper and shaving cream. She storms off to investigate. Dina quickly discovers that the chain link cage in the store room was left unlocked and there is a crate of irregular produce missing. The produce was scheduled to be shipped off and destroyed, but now someone has stolen it. Naturally, Dina refuses to let the employees leave until she has interrogated them all. The employees are upset by the possibility of their evening plans being ruined by her. Amy’s been looking forward to trick-or-treating with her daughter all day, Mateo has a date that he can’t tell anyone about, and Jonah is going to see Nosferatu at the theater. Amy calls on Glenn to put a stop to this but he cows under Dina’s command. While Dina’s busy interrogating employees, Amy calls a secret meeting in the store room for everyone else. She asks them to fess up about who stole the fruit, but no one does. 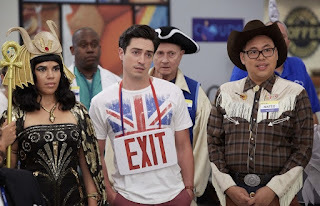 With no other options, Amy, Mateo, and Glenn decide to visit a neighboring Cloud 9 (NOT the one that had the stabbing) and steal their “uglies” to trick Dina into believing someone returned the produce. Amy and Mateo find the produce section and start searching for ugly fruit to purchase. Meanwhile, Glenn has wandered off and finds himself talking to a fellow store manager. As he asks where the bathrooms are, the assistant store manager walks up. While Glenn watches on, the two have a pleasant conversation and high five. Glenn is shocked at how nice the assistant store manager is and the great relationship the two have with each other. He’s more than a little jealous that he has to deal with Dina while this store has a really nice, respectful assistant store manager. Glenn is telling Amy and Mateo about the unfairness of the situation on the drive back when Amy gets a call from her daughter, who doesn’t want to go trick-or-treating anymore and would rather go over to a friend’s house. Amy is crushed but tries to play it off like she doesn’t care. Back at Cloud 9, Dina has followed Garrett into the bathroom to interrogate him about the produce. He’s doing his best not to stare at her chest, but since he’s refusing to look at her, she assumes he’s guilty of something. Garret finally crumbles under the situation and admits to stealing the fruit just so Dina will stop questioning him. Jonah is dealing with his own uncomfortableness while he mans the jewelry counter with Cheyenne. They’ve been gossiping about different employees when Cheyenne mentions that everyone thinks Jonah has a big crush on Amy. He’s immediately flustered by this revelation and tries to deny it, but it’s been pretty obvious since episode one of season one that this is true. Glenn, Amy and Mateo finally arrive back at the store and storm in just in time to stop Garrett from signing a false confession. Dina starts to be rude to Glenn again but, empowered by the interaction he saw at the neighboring store, he finally stands up to her and calls a stop to all the madness. The employees are finally dismissed to enjoy their night. Mateo meets Jeff behind the store and they head off to their date, but not before Cheyenne witnesses them leaving together. Garrett, Dina, and Amy decide to join Jonah at the showing of Nosferatu. As they’re walking out, Jonah complains that no one commented on his Halloween costume (he was Brexit). This was a fantastic episode. All the crazy quirkiness I love about this show was in high gear. The absolute best part was watching Myrtle, the elderly store employee, chase a poor customer dressed as Death around the store the entire episode. Priceless.